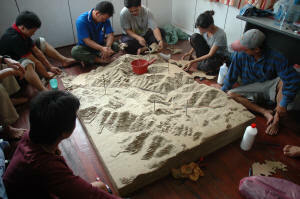 The model (288 km2) was built by Dusun Indigenous People with assistance provided by project staff. Located in the remote reaches of the upper Papar River, the villages in Buayan-Kionop are settlements that pre-date the 1984 establishment of the Crocker Range Park. Today, the three villages of Buayan, Tiku and Timpayasa are located outside the Park, whereas Kionop is located inside the Park. The people of Buayan-Kionop consider this area to be their ancestral lands. With no road access to markets, the Dusun people perform subsistence agriculture, hunting, and harvest of freshwater fish and forest products.